Size: 12.5 mL / 0.42 US fl. oz. for the big packaging. Mine offers 4 ml. The mini is absolutely the same as the full-size. It’s made of golden-coral plastic. Honestly, I was looking at this lip tint for quite a long time, but it was exactly due to that pearlescent packaging that I hadn’t bought it. Somehow I used to think that the tint inside would also have that pearlescent liquid gold color, as on the packaging and recently I stopped worshiping such shades in my lips. The packaging visually reminds me of a nail polish. The top cap is actually an applicator with a brush. You don’t have to use it to apply the tint on your lips, as it’s rather stiff and I guess it’s more for taking the right amount out. AQUA (WATER), ETHYLHEXYL STEARATE, BUTYLENE GLYCOL, PENTYLENE GLYCOL, HYDROXYETHYL ACRYLATE/SODIUM ACRYLOYLDIMETHYL TAURATE COPOLYMER, SQUALANE, DIMETHICONE PEG-7 PHOSPHATE, PHENOXYETHANOL, LECITHIN, POLYSORBATE 60, TETRASODIUM EDTA, SORBITAN ISOSTEARATE, DISODIUM EDTA. [: CI 12085 (RED 36, RED 36 LAKE), CI 15850 (RED 6, RED 7, RED 7 LAKE), CI 15985 (YELLOW 6, YELLOW 6 LAKE), CI 19140 (YELLOW 5, YELLOW 5 LAKE), CI 42090 (BLUE 1 LAKE), CI 45380 (RED 21, RED 21 LAKE, RED 22 LAKE), CI 45410 (RED 27, RED 27 LAKE, RED 28 LAKE), CI 73360 (RED 30, RED 30 LAKE), CI 77891 (TITANIUM DIOXIDE), CI 77163 (BISMUTH OXYCHLORIDE), CI 77491, CI 77492, CI 77499 (IRON OXIDES), CI 77742 (MANGANESE VIOLET)]. 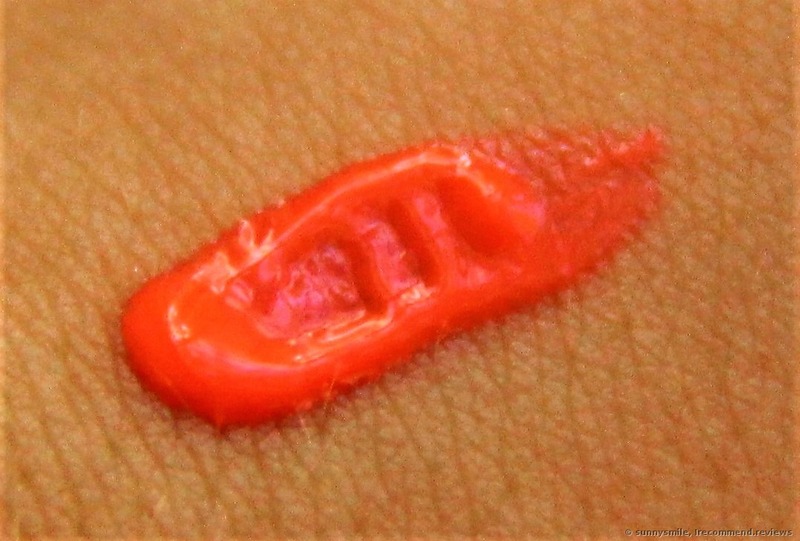 The maker claims that the shade is coral and even compares it with a ripe mango color. And, in fact, I agree. However, I admit that the number of applied layers can significantly influence the color of the outcome shade. The color can be varied from gentle, pink-carrot to a vibrant and coral-red. Texture: It’s pleasant and it’s more like a gel, which quickly dries down and sets. Scent: I can barely catch it. I can find some sweet notes to it and nothing more. It isn’t chasing or anything. I don’t feel it on my lips. I presume that my fingertips are the best tools for this product application. The gel texture spreads well and smoothly. However, one should be very quick to apply it. If you left a drop of the formula unblended, then you’re 100% will see a brighter pigment there. And it’ll be so difficult to smooth that pigment later. This lip tint ensures impressive staying power. The color polishes into my lips for a very long time. But if you eat or drink, be ready to face that the shade will fade a little, yet still, it’ll leave your lips delicately and smooch-less. For instance, if I apply the product on my lips in the morning, in the evening I’ll still see it present, with “my lips but brighter” effect. The product is easy to use. It spreads evenly and the most important thing is to apply it quickly, so as not to let it turn brighter in some places. It doesn’t settle in my lip fine lines and in general, appears well. This tint doesn’t make my lips dry. As many other lip tints, this one doesn’t affect my lip condition nor moisturize them or dry out. It just stands as a beautiful lip shade. If your lips are chapped, then it won’t accentuate flaking, nor even it out. I appreciate that I can vary the color payoff with ease. If I want my lips to appear brighter and pinker, then one small drop of the tint is enough. It feels as though the tint adjusts to my natural lip color, creating a “kissed lips” effect. If you’re not satisfied with such a result, then apply several layers then and get a beautiful, vibrant coral-red color payoff. To tell you the truth, such shade should go with your mood and it isn’t to everyone’s taste. As for me, sometimes I want to wear it, especially with the evening makeup. The removal isn’t quick or easy. You’ll never succeed if you try to wash it off with water and a cleanser. Or maybe you will if you try really hard. But I usually opt for a waterproof makeup remover. 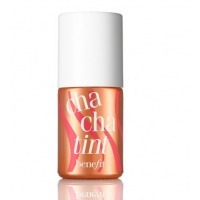 I’m pleased with this ChaChatint from Benefit. It offers good quality and I adore the way this color looks on my lips. After this one, I want to try out all the tints from Benefit now. Great lip stain for those who love vivid and long lasting lipsticks. Disgusting for those with dry lips. It’s a nice product and some people will really like it, but not me. My disappointment with Wet n Wild.